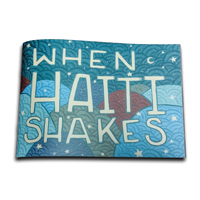 When Haiti Shakes is a new book was created by Headwaters Relief Organization to help children understand earthquakes and teach them what to do if an earthquake occurs. When Haiti Shakes will be donated by Headwaters Relief to several Haitian orphanages and schools. The group took the first set of books to Haiti during a relief trip this month, during which the book, puzzles and other educational materials were used to provide therapeutic support to the children. When Haiti Shakes is bound in material that can withstand the heat and humidity of the Haitian climate. The 2010 earthquake in Haiti was one of the most devastating on record, affecting more than 3,000,000 people. Headwaters Relief has conducted many relief trips to Haiti over the past four years providing mental health support, construction services and medical aid to the area including several orphanages and schools. 100% of public donations directly support people affected by disaster across the United States and around the world. About When Haiti Shakes: A Headwaters Relief volunteer since the age of 10, Madeleine Hage wrote When Haiti Shakes while interning for the organization in the summer of 2013. Aya Kone, a high school student in Germany contributed many of the drawings for the book. From the age of 8, Kone has also been a volunteer for Headwaters Relief. Dennis Lo, Kelsey King and Jocelyn Schmitt, a teacher and two former students of Minneapolis College of Art and Design contributed illustrations and provided coloration of Aya’s drawings. The book is available for sale at the Headwaters Relief Store.